I've got one more rainbow inspired layout to share. This time I played along with Scrap Our Stash. I used the following five items up from the list. I used a bunch of pop dots on this layout to keep some of the corners up and to give the clouds some layering. I kind of forgotten just how handy those little things can be in giving depth to a page. I also decided to keep my journaling hidden since this page has so much going on pattern wise with no good breaks. I absolutely LOVE this page!!!! You have really turned me on to rainbow! Looking forward to playing with some of the new items I bought. Keep the rainbow pages coming. Yours are gorgeous!! This is SO pretty! 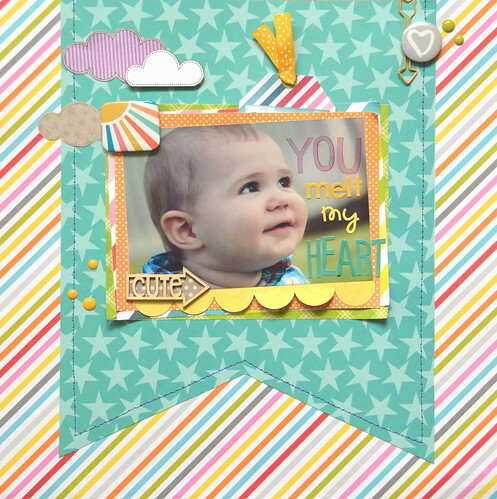 Adorable picture and perfect embellishments to match along! You did a great job with this challenge! Thanks for playing along at Scrap Our Stash! adorable layout!!! Thanks for joining us at Scrap Our Stash! adorable page, love that you used a banner as a layer. love your variety of embellies too. thanks for playing along with us at scrap our stash. Sweet layout and wonderful job with the challenge! 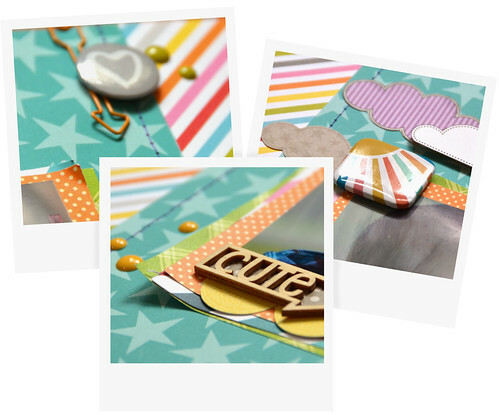 Thank you for linking up at Scrap Our Stash! ADORABLE! And nice job with the shopping challenge! Thanks for playing along at SOS!! Adorable photo and wonderful job on the shopping challenge! Thanks for playing along with us at Scrap Our Stash! Very cute! I love your list, and your design too! Thanks for playing with SOS! What a beautiful and precious LO. So cute and awesome take. Thanks for playing along with us at Scrap Our Stash! that is so beautiful! love the colors! Thanks for playing along with Scrap Our Stash! Aaw this is so cute! Love the bright colours. Thank you for joining us at Scrap Our Stash.